R5 has been configured to be the RP/MA for all multicast groups in this topology (auto-rp is used). 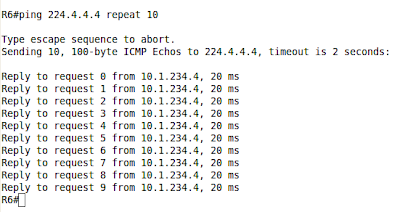 R2's Et0/0 must emulate the client of multicast group 224.24.24.24. R4 must stream packets to this group. Make sure the client receives this traffic. R5 has been configured to be RP/MA for all multicast groups in this topology (auto-rp is used). R2's Et0/0 must emulate the client of multicast group 224.24.24.24. R4 must stream packets to this group. Make sure the client receives this traffic. Pic. 2 - (*, G) for 224.24.24.24 Registered. Ping from R4 to 224.24.24.24 does not work now. Pic. 3 - Ping from R6. 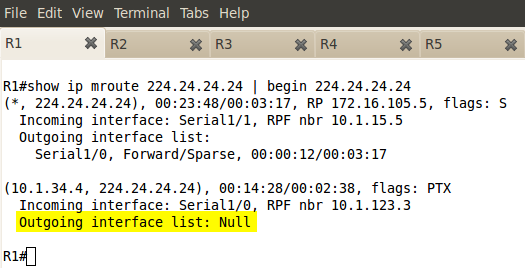 However, the (S, G) entry shows in RP (multicast sender). 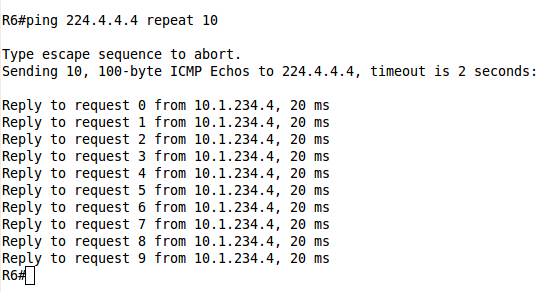 The problem is that multicast reaching R1's S1/0 cannot be sent back out S1/0. Pic. 4 - Mroute Table in R1. R1 cannot send multicast back out the interface it received this feed. However, using PIM Sparse Mode we can accomplish this using PIM NBMA. This mode can reflect the traffic back out the same interface it received the traffic. In addition to this it will send the multicast only out the circuits which have the clients registered for the group. For example, if R6 sends the traffic towards R2 (group registered there), and R3 did not register the group, R1 sends the multicast packets out of all its circuits in hub-and-spoke FR topology (towards R2 and R3). With PIM NBMA turned on, only circuits that registered the clients, will receive the feed. Ping from R4 to 224.24.24 succeeds now. Pic. 5 - Ping from R4. Pic. 6 - Mroute Table in R1. Configure R5 so that it does not send the administratively scoped multicast address space towards R6. Administratively scoped multicast range is: 239.0.0.0/8. R1 is the RP and MA in the multicast domain. Configure R1 so it allows all multicast group registration only if it sourced by 10.1.234.4. All other sources should be denied. R1 is the RP and MA in the multicast domain. Configure R1 so it allows all multicast group registration (multicast stream) only if it sourced by 10.1.234.4 (server). All other sources should be denied. Based on the previous lab (Lab 151), R1 is the RP and MA (Mapping Agent) for all groups. As per your boss request, you must configure R2 and R3 so that routers should register (*, G) entries only for the group 224.40.40.40 and can be destined for 172.16.101.1 (RP).This group cannot be registered with any other RP. Based on the previous lab (Lab 151), R1 is the RP and MA (Mapping Agent) for all groups. As per your boss request, you must configure R2 and R3 so that routers should register (*, G) entries only for the group 224.40.40.40 and can be destined for 172.16.101.1 (RP). This group cannot be registered with any other RP. Pic. 2 - Another Group Registration. After R4 have joined the 224.64.64.64, R1 (RP) does not have the group registered. It has been pruned on R2 (PIM DR). Pic. 3 - R2 (PIM DR) Prunes the Join Message. R2 does not build the 'register message' and the group has not been registered with RP. All routers are running EIGRP protocol as well as multicast routing. All transit interfaces have been configured as Sparse-Dense! All routers in the topology run PIM Sparse Mode. 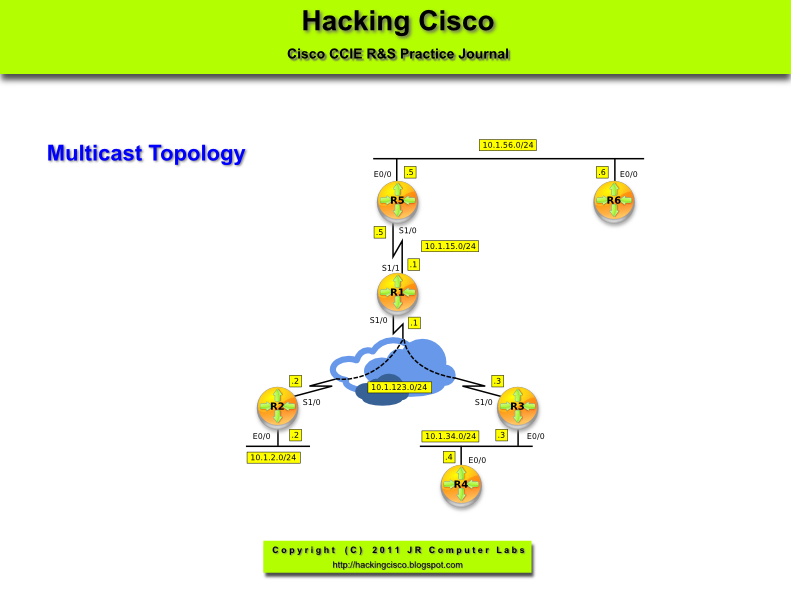 Configure R1 as RP for all multicast group and R2 as the Mapping Agent. Do not change the PIM mode to accomplish this. 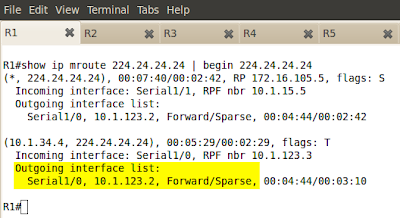 The problem I'm going to run into is that in order for a router to advertise itself as the RP candidate, it needs to know which router is RP (none available at the moment) since Auto-RP uses multicast address 224.0.1.39 to announce it. Also, the Mapping Agent must register the group 224.0.0.40 with RP in order to announce which device is RP. One solution to this problem is to use PIM Sparse-Dense Mode. But the lab stipulates, that PIM Sparse Mode currently configured cannot be changed. 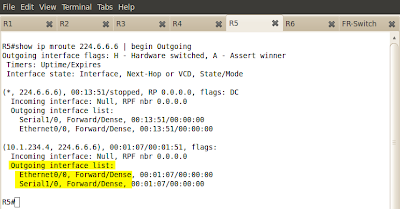 Another solution is to use Auto-RP Listener option on all routers in the multicast domain. This feature, allows the RP candidate and the Mapping Agent advertise these two groups out the PIM Sparse Mode interfaces as Dense Mode. Pic. 2 - RP Information on R6. All routers learn which device is RP. All routers are running EIGRP protocol as well as multicast routing. All interfaces have been configured as Sparse-Dense-Mode. The routers in the topology run multicast routing. The transit interfaces use sparse-dense-mode. In order to split the RP's load in half, configure R2 to advertise its loopback as the candidate RP for groups for groups 224.0.0.0 - 231.255.255.255. Configure R3 to advertise its loopback as the candidate RP for groups 232.0.0.0.0 - 239.255.255.255. R4 should be their Mapping Agent. Pic. 2 - RP Mapping. Pic. 3 - R2's RP Announcement. Pic. 4 - R3's RP Announcement. 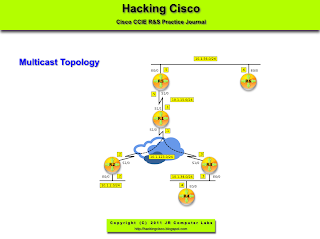 Configure multicast domain using the topology diagram. The multicast clients on subnet 10.1.234.0/24 will join 224.4.4.4 group. Ensure that multicast traffic is distributed to the clients which join the group explicitly. Do not enable multicast on 10.1.51.0/24 subnet. R5 should become RP in the multicast domain. Configure R4's Et0/0 to join the group 224.4.4.4. On R6 use ping to verify if R4 receives the multicast traffic. 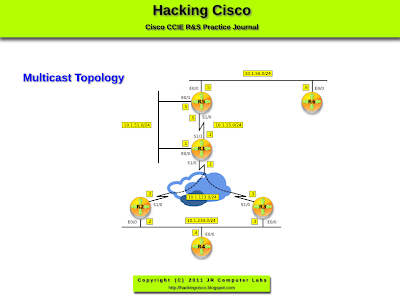 Configure multicast domain using the topology diagram. The multicast clients on subnet 10.1.234.0/24 will join 224.4.4.4 group. Ensure that multicast traffic is distributed to the clients which join the group explicitly. Do not enable multicast on 10.1.51.0/24 subnet. R5 should become the RP in the multicast domain. The 'ip pim dr-priority 20' is configured so R2 sends the pim join message on behalf of 10.1.234.0/24 subnet. R4 becomes multicast DR by default. I have found that if R4 joins the group, it does not want to send the register message at the same time. That's why I make R2 the DR for this subnet. 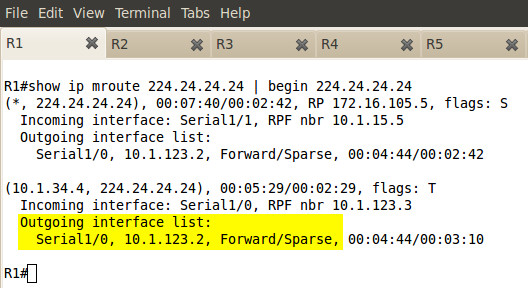 The 'show ip pim interface' and 'show ip pim neighbor' commands show proper output. 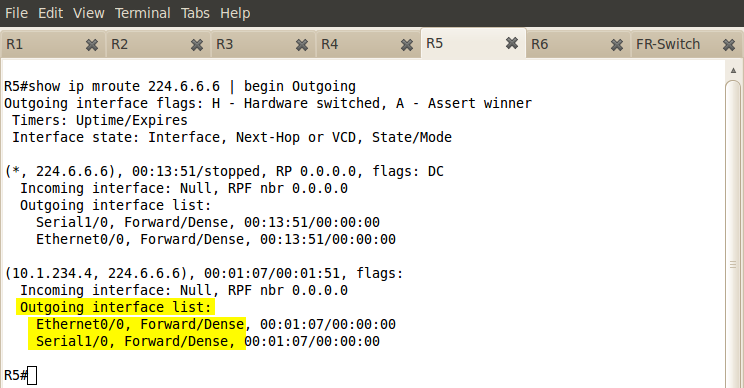 The problem here, is that for R1 to reach the RP (172.16.105.5) the best path is through Ethernet (10.1.51.0/24). These interfaces are not enabled for PIM. As a result of this, the PIM join message will not reach the RP and the group is not going to be registered. Pic. 2 - R2 (DR) Multicast Routing Table. The reason for not sending the group register message is that R1's routing table points towards RP out its Et0/0 rather than Se1/1. But Eth0/0 is not enabled for multicast. 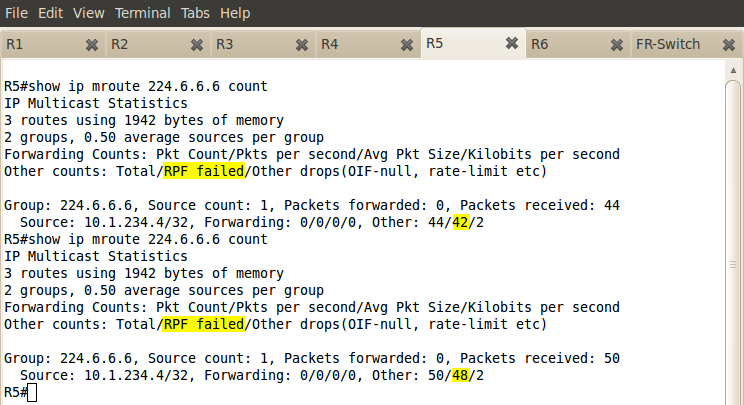 In order to solve the problem, I must force R1's multicast protocol into believing that connection towards 172.16.105.5 out its s1/1 interface is better than given by the EIGRP protocol. Pic. 4 - R5 (RP) Registers 224.4.4.4 Group. Pic. 5 - Ping Test.